Through the years, homeowners who have been aware of air transfer and loss through the attic have attempted to solve this problem by placing insulation around the attic door opening. Unfortunately, this technique doesn't provide an air tight barrier, therefore, little reduction in the amount of energy waste and air loss is achieved. This also creates harmful airborne particles of dust and fiberglass each time the attic door is opened or closed. 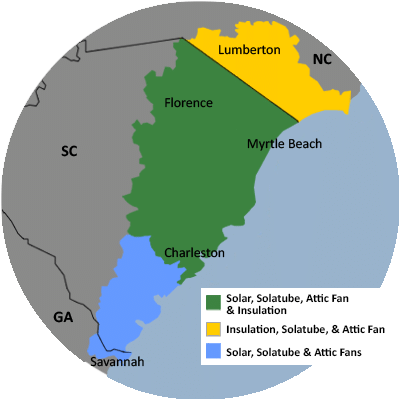 To solve this issue of creating an air tight barrier in your attic, Carolina Energy Conservation is pleased to be able to offer to our customers the Attic Tent. The Attic Tent is a specially engineered, patented insulator designed to create an air transfer barrier between your attic and living areas. It is a practical and economical solution to a problem that has existed since homes were first built with overhead attic entries. That problem is wasted energy through and around the attic door and stairs. The engineers behind the development and manufacturing of our Attic Tents, solved the problem of attic air transfer and loss from the perspective of the homeowner. They designed a product that not only significantly reduces air loss, but also drastically helps to lower your energy bill. Our Attic Tent also provides a safe and easy zipper feature to allow for easy movement into and out of your attic. The Attic Tent, also keeps blown-in insulation up in the attic where it belongs, not on your floor, each time you open your attic stair door. Are you looking for an effective barrier between your attic and the lower floors of the home? Call or contact us today to learn more about the Attic Tent, or to schedule a Free Quote. The amount of money you will save will vary depending on the severity of your climate. The Attic Tent has been proven to reduce air transfer by at least 71%. That's less energy used to heat and cool your living area being lost into the attic. Many home owners have found they have been able to recoup the cost of the Attic Tent in as little as one year!! How difficult is it to install the Attic Tent? The Attic Tent is rather easy to install. It easily fits around your attic stair frame and can be secured with staples to any surface, smooth or not. The final step to having your Attic Tent properly installed is to finish it off by placing a bead of caulk around the seam for an air tight fit. What is the Attic Tent made out of? The patented Attic Tent consists of a durable shell, made of space age synthetic casing. This high-end material is then adhered to 1/2 inch thick micro-fiber urethane insulation. It is lightweight, ultra-thin, and ultra-effective! How do I get in and out of my attic once I've had the Attic Tent installed? The Attic Tent is designed with non-corrosive, heavy-duty zippers that allow easy access to your attic while keeping harmful dust and old insulation particles in the attic. This improves indoor air quality and keeps the insulation off of your floors. Does the Attic Tent have an R-Value? The Attic Tent materials have been calculated to have a 3.2 R-value. It is designed to be an air transfer barrier between your attic and the living areas below. This is the same principle behind storm doors and storm windows. TUCKER ENGINEERING calculated monthly savings based on a conservative 32-degree differential in temperature between the attic and living space, for both hot and cold seasons. After installing an Attic Tent, the actual R-value should increase (applied R-value) when including the attic door and empty space between the door and the tent.